75/76/78 Light Medium Duty - PDF - Casters Of Amarillo, Inc.
75/76/78 Light Medium Duty Series casters serve as premium food service and institutional swivel casters. Their heavy gauge cold rolled steel design gives these casters maximum durability. Some features include hardened double ball raceways for added strength and extra long service life. The design also features a metal dust cap over the upper raceway of the swivel casters as well as a choice of a matching rigid caster. The rigid casters come in either a 2 piece cut and welded design (76 series) for strength and abuse, or a one piece stamped and formed design (78 series) for a combination of economy and durability. There is also a wide range of fastenings, wheel types, colors, bearings, brakes, and other options to choose from. 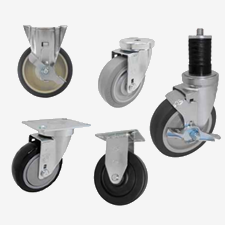 Popular industries using these casters include: food service and food processing, bakeries, institutions, hospitals, schools, laboratories, retail environments. These commonly get used for material handling carts and trucks and various other light medium duty applications. These applications often require a higher standard of quality and functionality. This series is available in 19 popular fasteners which come permanently attached as well as a dozen modular stems. The standard zinc plated finish is attractive and resists corrosion.